The Lagos state Police command has rescued one Miss Sa’adat Bibire, who is the current Miss Nigeria International 2014 & daughter of an aide to Kwara state Governor, from her abductors. 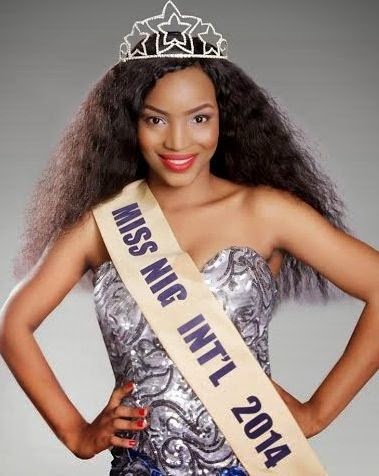 The beauty queen was abducted two weeks ago by a gang of kidnappers who lured her into visiting Warri, Delta state from Lagos by impersonating Africa’s richest man, Aliko Dangote on the social media platform facebook. Pardaing the suspects before journalists on Wednesday, the Lagos state police commissioner, said “the gang is made up of students of the Delta state Polytechnic Ozoro…they opened a Facebook account disguising as Aliko Dangote and contacted Sa'adat. They invited her to Warri with the promise to make her Dangote brand ambassador. On getting to Warri, Sa'adat was kidnapped and taken to a place on the outskirts of Ozoro town in Isoko Local Government Area in Delta state. The kidnappers then contacted her family and asked for N20m ransom, which was supposed to be paid into a Malaysian account. We began a manhunt for them after they contacted the girl’s family but only one of them was arrested while the others are currently on the run.” In his statement to the police, one of her abductors, 23 year old Patrick Ifada said he was lured into the kidnap gang because of the money offered "I accepted to join the gang because of the money involved. We opened a fake Facebook account pretending to be Alhaji Aliko Dangote and we convinced her to come over to Delta State to meet the businessman. At first, our ransom was N20 million. When they were not forthcoming with the money, we brought it down to N15 million and then N10 million. I was the one staying with the victim in our hideout. We were using the quarters of one of our members, Destiny. We are five in number and I was promised a huge sum. Other gang members are Destiny, Marcus Omajuwa, Ugada and Chuka. We are all students of Delta State Polytechnic, Ozoro, ND 1. I was studying Computer Science. She was in our hideout for about two weeks. We asked the Special Adviser to pay the ransom into a Malaysian account that one Fred helped us to set up. None of us raped her. Destiny told us we were only going to make money from her family, and not to assault her"